Ayles, G. Burton. "Freshwater Institute (FWI)". The Canadian Encyclopedia, 04 March 2015, Historica Canada. https://www.thecanadianencyclopedia.ca/en/article/freshwater-institute-fwi. Accessed 25 April 2019. Working on ELA Limno corrals (courtesy Freshwater Institute). The Freshwater Institute, located on the University of Manitoba campus in Winnipeg, Man, is one of the world's leading research centres for freshwater and Arctic fisheries research. It is also the regional headquarters of the federal Department of Fisheries and Oceans (DFO) for Ontario, the Prairie provinces, the NWT, Nunavut and the Yukon North Slope, including the Arctic Ocean. The Canadian Food Inspection Agency also has staff located at the institute. The predecessor of the FWI was the Central Fisheries Research Station of the Fisheries Research Board of Canada. Established in Winnipeg in 1944, the station was moved to London, Ont, in 1957 and then back to Winnipeg as the FWI in 1966. New laboratory and office facilities were opened in 1973. 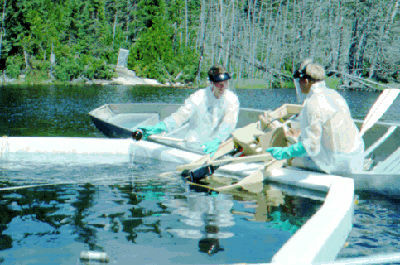 The FWI provides facilities for fisheries and environmental research in inland and Arctic waters as well as for the non-research activities of the region, such as fish and marine mammal management and protection in the Arctic; Arctic oceans management programs; protection of fish habitat in the prairies and the Arctic; and the management of federal harbours. Originally conceived as an institute focusing exclusively on freshwater issues, the activities of the FWI shifted to include Arctic fish and marine mammals in the early to mid-1980s. The proclamation of the Canada Oceans Act in 1997 added to the Arctic Ocean programs managed by the FWI. In 1998 the DFO assumed full responsibility, from the provinces, for the management of fish habitat protection in the inland waters of Ontario and the Prairie provinces. Along with the National Water Research Institute in Burlington, Ont, and Saskatoon, Sask, both operated by the federal Department of the Environment, the FWI is one of the major federal government centres for freshwater research. With the Bedford Institute of Oceanography in Nova Scotia, the Maurice Lamontaigne Institute in Quebec and the Institute of Ocean Science in British Columbia, it is one of the major federal government centres for arctic marine research. Scientists at the FWI have played a critical role in a number of regional and national issues relative to freshwater, freshwater fisheries and arctic marine fish and marine mammals. They have included research on the impact of arctic oil and natural gas development on fish and marine mammals; the effect of commercial, recreational and subsistence harvesting of fish such as Arctic char; Inuit subsistence harvesting of marine mammals such as seals, beluga whales, narwhals, bowhead whales and walrus; the impact of hydroelectric reservoir developments on fish and fish habitats; toxic contaminants in fish and marine mammals; aquaculture development; and acid rain. Scientific disciplines at the FWI include population biology, limnology, water chemistry, toxicology, fisheries and marine mammal biology and related fields. Studies are carried out in extensive laboratory facilities at the FWI and at field stations located at various latitudes from the Canada-US border to the arctic islands. In 1992, Dr. David Schindler, now of the University of Alberta, received the Stockholm Prize, aquatic science's equivalent of the Nobel Prize, for research studies carried out by the FWI at the Institute's Experimental Lakes area field station in northwestern Ontario.